According to the ESM, Ireland will have to pay 11,145,400,000 as it’s capital subscription. – http://en.wikipedia.org/wiki/European_Stability_Mechanism The Fiscal Treaty was put in place for “Acceleration of the ESM treaty ratification and entry into force, as well as amendments to it.” – http://en.wikipedia.org/wiki/European_Fiscal_Union This ESM is serious, if it starts doing what is proposed and asking for money that countries dont have, we could have a European war of Independence on our hands. Thank you Stephen for your contribution and may I say it’s refressing to know some of our youth are showing an interest in their own future and the future of their country. With the help of Frankfurt and Parisian sources, US contacts, and German readers of this site, The Slog has been able to put together compelling evidence of Greece being perilously close to ejection from the eurozone. Doubts in Brussels and the IMF, preparations in Berlin – and clauses in the bailout agreement – all point to a German determination to either amputate Greece, or leave the eurozone itself. If there is a single investor left anywhere on the planet who thinks the Troika bailout of Greece was undertaken with any genuine commitment, then after reading this post, there won’t be. Late yesterday evening (GMT Sunday) I spent some time debating facts, signs and issues with The Slog’s longstanding source, the Bankfurt Maulwurf. This followed a series of steers from Slog readers and other sources. I turn first to the bailout agreement itself…where some startling things come to light. For starters, the EFSF (for that’s the principal in this document) is already in breach of it. 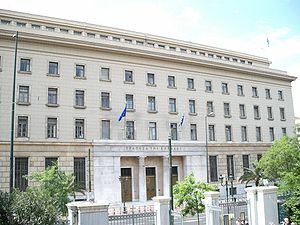 Early up in the opening clauses, the stability fund undertakes to use funds from its existing budget to bail out Athens. As The Slog showed conclusively last week, this isn’t what happened: the ‘funds’ released were ECB non-cash bonds. The EFSF has yet to find a single investor anywhere to partake in the fund. I have no doubt that Germany is preparing the push Greece and the Irish republic out of the Euro .The latest proposed referendum is in fact the instrument (Stick) they will use on us, as the legal binding financial constraints will crippled the Irish economy and will force us to in effect” default”. Our national yearly budget defect is approx 18 billion but with the imposition of even more austerity measures concealed within this new amended treaty we are in on position financially to honour the proposed financial constraints within the new amended treaty .This treaty was put together in Berlin and has the total interests of Berlin enshrined within it . This treaty obliges the Irish to introduce savings over the next 10 years of, at least 6 billion euro each year on top of the existing heavy burden of interest payments on the current national bebt of 122 ++ Billion not to mention the garneted debts of the toxic banks .As it is this debt level is just no sustainable and anybody with an ounce of sense can see we are been setup for a massive fall and we are been asked to supply the banana skin .Wake up Ireland and say no to this fraud. gombens, political leaches and gutless creeps who are only looking out for their own selfish interests. The current government are no better that the Fianna Fail gangsters who sold off our country. As for Labour they have betrayed the very name they carry and have shown themselves to be just as corrupt and ready to lie down with dogs that are tearing the flesh of the bones of the overburdened taxpayers of this sorry country .Shame on every one of them!